Google Picasa is a Free photo management tool with good editing capabilities which lets you create slideshows, movies , collages,etc. You can easily manage,edit and share your photos online with Picasa. It works very well with Google's free Photo sharing site Picasa Web Albums. Until now, Google's online photo application was only available to Mac users through a browser and iPhoto plugin.Now, the same features that have been on Windows and Linux for years are now ready for Mac users... finally Google released the Mac version. There are some features missing in this Google Picasa 3 beta version for Mac including the feature to order prints, Picasa photo viewer,screen capture, webcam capture,etc. 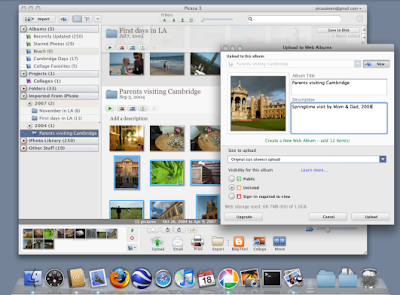 » iPhoto 4.0 or later required to use the iPhoto plugin. You can Download Picasa 4 for Mac here. I hope it performs as fast as the Windows version did. I found Picasa an amazing tool. One thing I didn't like was that it scanned the pc for photos on the entire PC, I share this pc with my family. There is a feature for you to select which users you want scanned. Picasa users pay attention while going through the install process! One family member had, shall I say, objectionable pics, ones that I wouldn't want uploaded to my picasaweb account! Download Picasa 4 for Mac here. I have post new articel can you give it a score !!! ?